1957 : les meilleurs films de l'année. A new starlet is discovered and has ups and downs in Italian films. Paola is a young, beautiful woman married to a wealthy entrepreneur. She meets her former lover Guido after seven years, but their relationship is marked by tragic events. Antonioni is one of the sages of cinema, perhaps the wisest of them. His cinema is a stunning edifice; a structure rigid and harmonious as shaped by a visual vocabulary which articulates with few words a place and a time; pattern and blueprint, whereby each film as individual level informs and is informed by the whole; these levels filled with doors to insight and intuition. To all these doors he holds the keys, and in the spaces behind the doors, which are closed to most filmmakers, he moves freely and sees everything. Meditation as stillness of mind, which enables awareness. Naturally some of these levels are more aptly functional, staircases that lead higher. 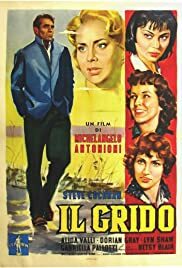 Il Grido is one of those (and La Notte later). Nonetheless we see here the early sketches of what is to come. We see a man cast adrift after a painful breakup as passing through various lives, affecting them with shortlived passions and vexations. Each of these lives he briefly shares could be a possible new home, a safe harbor where peace and happiness are finally possible. But he moves on, still clinging to a mad hope and frustrated desire that his old affair could resume at any point. So this is the fascinating stuff. A man alone, itinerant, ostensibly free to be what he may, but captive of his desires so that he's nothing at all, except perhaps a painful memory. The downward spiral into squalor and misery is not simply the upkeep of a bad karma, but a reminder of what fuels the restlessnesss. What negativity keeps him going, regret or unfulfillment, will only be encountered ahead of him, it cannot be escaped by running from it. In passing through these phases the film perhaps stalls for too long. We understand what is going on, the proverbial journey of an empty, unfulfilled life, but Antonioni wants to shape these lives as lived, meaning we get the mundane details of their routine. The comings and goings and side characters, as vignettes. This is the neorealist baggage ostensibly cinema in the service of revealing/documenting society, which Antonioni is about to shed for his next film, and be free as a creative spirit. For the end Antonioni reserves defeaning symbolism, by contrast to the hazy allusions he would favour onwards. The man climbs on the refinery tower, the place and time where he was for once happy in his life and which now seems impossible to attain again, and we don't even have to guess what happens next.